Healthy bone density as you age? In spite of menopause? Sounds like really good news to me; I'm instantly interested. Research done at Loma Linda University over the course of 25 years on peri-menopausal and post-menopausal women sheds some light on how to achieve strong, viable skeletal health. And this key is nutrition. Turns out that there's a direct correlation between vegetable protein in your diet and a lower incidence of wrist fractures. Research done on the diets of 1,865 women revealed this nutritional benefit. Many people already know that being physically active leads to fewer fractures as you age--especially in the wrists and hips. This is partly due to the phenomenon of weight-bearing exercise improving density of your skeleton. 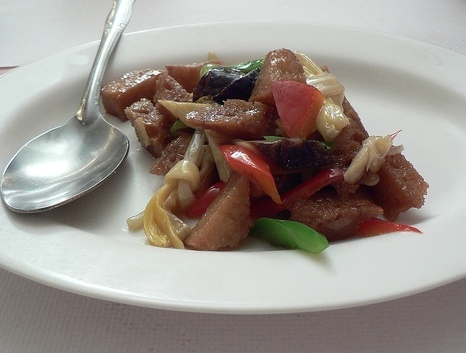 seitan--(pictured above)--a lesser known protein from wheat called "wheat meat" or "gluten"
...and among these vegetarians, those who ate the greatest amount of vegetable protein has the lowest risk of wrist fracture. Oddly, the intake of calcium throughout the entire test group didn't vary significantly between the women eating varying amounts of protein. My thanks to researchers D.L. Thorpe, S. F. Knutsen and W. L. Beeson, among others, and their results published in August 2007 in "Public Health Nutrition." "One reason that healthcare professionals may recommend nutritional supplements -- to "fill the gaps" in those areas where our diet may fall short." 82% of the nurses recommend supplement use for their patients. Would you like to know the health categories most likely to receive a supplement recommendation? Or, shadow-boxing! Women's bone mass density (BMD) has been shown to increase as they do plyometrics, jumping rope and shadow-boxing as part of their workout. For a two-paragraph article on this subject, "Knock out Bone Loss,"
take a brief detour to Applied Physiology, Nutrition and Metabolism. Return from Healthy Bones to Healthy Aging page.